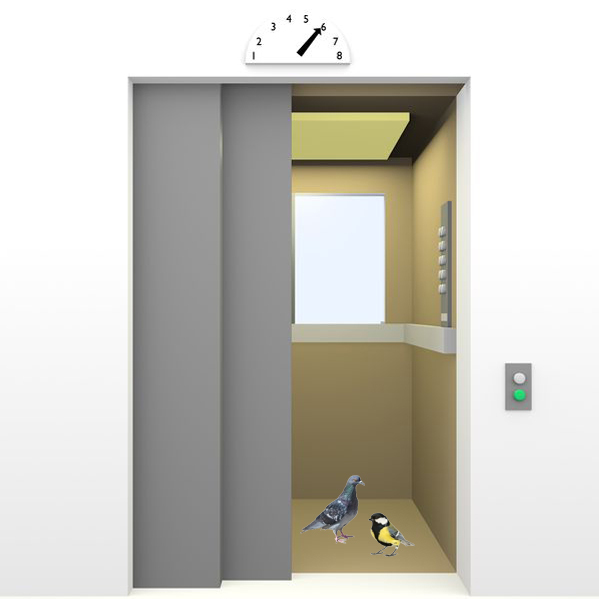 Look at the 7 illustrations of flues below and click on the one that looks like your round flue. 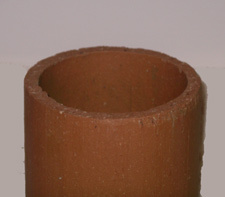 Below is a Clay Flue , a terra cotta pipe also known as a Masonry Flue. The chimney caps below fasten to the outside of round clay flues. 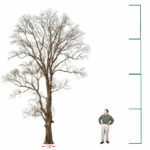 What to Measure: Measure the outside diameter of your flue to select the appropriate size chimney cap. What to Measure: Measure the inside diameter of your flue to select the appropriate size chimney cap. Below is a flue that is a Single Metal Pipe such as a Stovepipe. Each round flue chimney cap below fastens to the outside of single metal pipe flues such as stovepipes. Each round flue chimney cap below slips into single metal pipe flues such as stovepipes. 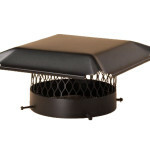 A Flexible Metal Flue Liner requires a chimney cap with a base that inserts into the flue, such as the ones below. 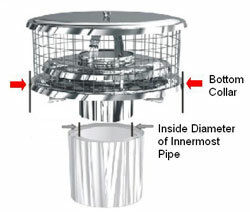 Below is a flue that is a cut-away illustration of a Double Walled Air Insulated Flue or a Double Walled Air Cooled Flue. 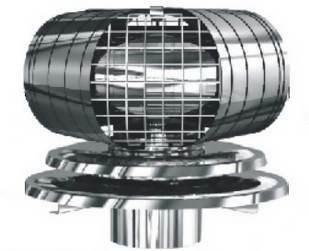 A Double Wall Air Cooled flue is also known as an Double Wall Air Insulated flue. These have one pipe inside another. Air circulates in the open space between the two pipes to cool the flue. 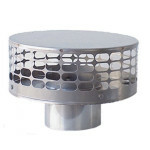 This type of flue requires a round flue chimney cap specially designed to allow the air circulation that is needed. What to Measure: Measure the inside diameter of the innermost pipe and the outside diameter of the outermost pipe; the bottom collar of the chimney cap should be large enough to cover the outermost pipe. 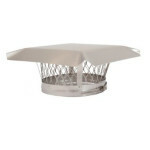 Select a round flue chimney cap that is nominally the same diameter as your innermost pipe. 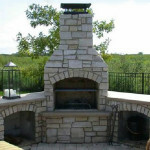 (Example: a 6 inch flue uses a 6 inch Weathershield or Vacu-Stack chimney cap). 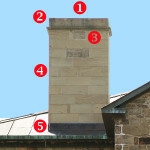 The bottom collar (indicated by the red arrows in the diagram to the right) of the chimney cap should be large enough to cover the outermost pipe of your chimney. Below is a cut-away illustration of a Solid Pack Flue, also known as a Double Wall Insulated or Solid Pack Insulated Flue . Insulation within the flue distinguishes a Solid Pack flue, also called a Double Wall Insulated or Solid Packed Insulated flue. In many, the actual insulation in covered, as shown in the cut-away illustration to the left, and, therefore, not visible as you look down into your flue. What to Measure: Measure the inside diameter of the innermost pipe(the flue). 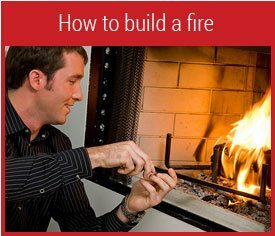 Select a chimney cap that is nominally the same diameter as your flue. (example: a 6 inch flue uses a 6 inch Weathershield, Homesaver Pro, or Vacu-Stack chimney cap). Below is a cut-away illustration of an Exposed Insulation Solid Pack Flue. Can you actually see insulation between the two concentric pipes of your flue? Then you have an Exposed Insulation Solid Pack flue. Some chimney caps for double or triple walled air-cooled chimney caps will work for Exposed Insulation Solid Pack flues. 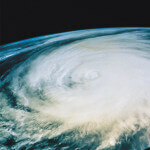 What to Measure: Measure the inside diameter of the innermost pipe (the flue). 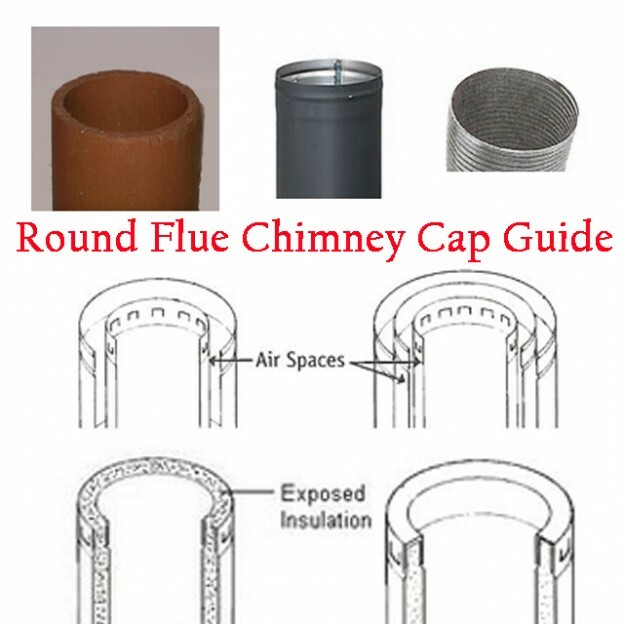 Select a round flue chimney cap that is nominally the same diameter as your Exposed Insulation Solid Pack’s innermost pipe. Below is a cut-away illustration of a Triple Wall Air Insulated Flue , also known as a Triple Wall Air Cooled Flue. Triple Wall Air Insulated flues have three concentric pipes. Cooling air circulates in the open spaces both between the outermost and middle pipe and between the middle pipe and innermost pipe. This type of flue requires a chimney cap that can circulate air between the flues to cool them. Last updated by Tom at July 19, 2016 .